Pictures can help you to visualize the beauty of Prague in the Czech Republic — although there's nothing like visiting it yourselves. An historic city of church spires, red roofs, and bridges, Prague is topped by a castle that evokes legends and fairy tales. Many of the oldest and most distinctive buildings in Prague are gilded and lit at night, inspiring even amateur photographers to shoot pictures of this extraordinary city. The following Prague photos provide a small idea of its scenic and cultural attractions for couples. Prague is basically a walking city, but as you can see from this photo there are other means for touring its landmarks. Bring a good pair of walking shoes to Prague, ones that are comfortable over cobblestones. You can see Prague on foot, by tram, bus, private or touring car, even romantic horse-drawn carriage. It's always more valuable to see a city in the company of a guide (especially one who lets you stop to shoot pictures), or with a guide book in hand. At the least, get a map; better Prague hotels will make one available free of charge at the front desk. The Charles Bridge, spanning the Vltava River, is the oldest bridge in Prague. Work on the gothic-style Charles Bridge began in 1357. It was completed at the start of the 15th century. Some 20 religious statues are mounted on the north and south balustrades of Prague's Charles River Bridge. St. Anthony is in the company of the baby Jesus. The Charles Bridge is one of the most famous and photographed landmarks in Prague. Every tourist in Prague ought to cross the Vltava River at least once on the 15th-century Charles Bridge. The Vltava River bisects the city of Prague, separating Mala Strana and the Old and New Town districts. From the 13th century through to the Holocaust, Jews were a factor in the civic life of Prague and the city contained several synagogues. Prague's Jewish Quarter in the Old Town, also called Josefov, contains an ancient Jewish cemetery, museum, and synagogues. Find out more about this Old-New Synagogue. It was in Prague that the legend of the Golem emerged. Told by Rabbi Loew ben Bezalel to his grandson to calm the youngster's fears that the Jews inside the ghetto would be slaughtered, the Golem was a walking Frankenstein-like monster made out of clay. Many brilliant and accomplished individuals from this part of the world, including Franz Kafka, Gustav Mahler, Sigmund Freud, Milos Forman, Madeleine Albright were born Jewish. The Terezin military fortress outside of Prague was used as a transit camp during World War II, deporting Jews to concentration camps elsewhere in Europe. About 80,000 Prague Jews were exterminated in the Holocaust. Fewer than 2,000 live in the city today. An estimated 200,000 Jews were buried in Prague Jewish Cemetery between 1439 and 1787. The graveyard inside the Jewish ghetto is not large, but it was one of the few spaces available to the people to bury their dead. Over time, corpses in coffins were layered atop one another. A church that is among Prague's oldest and most distinctive, the gothic, twin-towered Our Lady before Tyn has stood over the Old Town since the 14th century. Attuned to both the time and the zodiac, Prague's astronomical clock chimes every hour. The combined effort of a professor and a clockmaker, the mechanical clock and astronomical dial date to 1410. Picture yourselves tooling around Prague in this handsome tufted carriage. 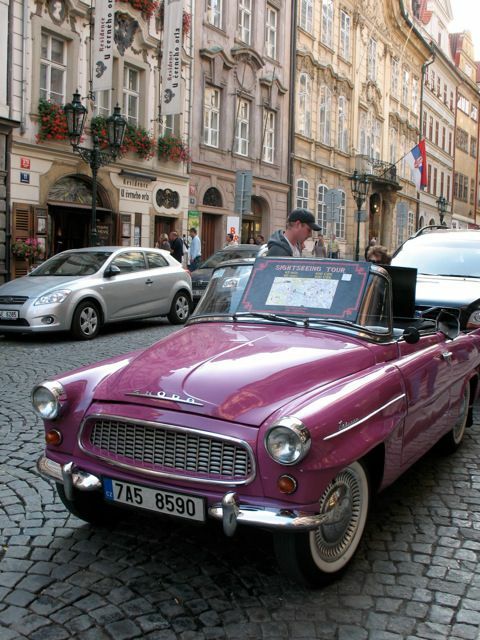 Many streets in Prague are pedestrian-only, but you can still see a lot touring from this conveyance. High on a hill overlooking the city, the buildings that comprise Prague Castle once housed Czech kings, holy Roman emperors, and country presidents. The no. 1 attraction in Prague, the Castle district includes churches, palaces, gardens, and other structures set along cobblestone streets. It could take days to see and a lifetime to grasp the historical importance of Prague Castle to the nation. As most visitors only have a few hours, they tend to compress a visit to include witnessing the noon changing of the guards and a visit to St. Wenceslas Chapel inside St. Vitus Cathedral. The French Gothic-style St. Vitus Cathedral was founded in 1344. Additions in subsequent centuries are in Renaissance and Baroque styles. In addition to beautiful but anonymous stained-glass windows, the Cathedral also contains an exquisite one designed by the famed Czech artist Alphonse Mucha that was installed in 1931. Nebozizek restaurant stands high above the city, and from the grounds couples can take in sweeping views of Prague. The leading example of Art Nouveau design in Prague, the Municipal House was completed in 1911. For lovers of Art Nouveau style, the interior of the Municipal House is nothing short of magnificent. Furniture, lamps, wall paintings, every detail inside this structure is decorated with priceless works by leading Czech artists from the early 20th century. The Municipal House is home to the Czech National Symphony Orchestra. Its Smetana Hall, named after the well-known Czech composer, is one of the city's main concert halls. This mural by Czech artist Alphonse Mucha is inside the Mayor's Hall inside the Municipal House. The vast Municipal House contains many beautifully decorated rooms, two of which bear the handiwork of Mucha. His pictures grace the walls and ceilings, and he was also involved in the selection of lighting, curtains, and furniture. Civic weddings may be held in the Mayor's Hall, and the building contains both a formal restaurant and a stylish cafe in which couples can celebrate after the ceremony. How romantic! The Mayor's Hall, where weddings are conducted, is illuminated by light from this window by Alphonse Mucha. Information space rentals in the Municipal House can help you to decide what room is best for a wedding ceremony and reception. The café on the ground floor of the Municipal House is also decorated in Art Nouveau style. An elegant space to have breakfast or take tea, the Municipal House Café opens its doors in warmer weather and permits alfresco dining. If you love diamonds, go to New York, Antwerp, Israel, London or Mumbai. But if you love garnets, the place for buying them is in the Czech Republic. Find out more about buying Czech garnets. Creating realistic marionettes and performing with them in puppet theaters has a long history in the Czech Republic. Characters may be based on historical or literary figures, fairy tale creatures, everyday people, or original themes. The 1920s and 1930s were considered the golden age in Prague, and it was a time that Cubism flourished. Even the building that houses the Czech Cubism Museum, known as the House at the Black Madonna, incorporates blocky, faceted Cubist elements in its design. The restaurant at the Czech Cubism Museum features design elements inspired by the Cubist movement. In warmer weather, patrons of Grand Cafe Orient can order their sandwiches and sweets, beer and soft drinks on the second-floor balcony. It wasn't long after World War II that the Communists took over the country, and their iron rule lasted until the "Velvet Revolution" of 1989. This fascinating museum offers a written narrative that visitors can read as they move through the rooms dedicated to different aspects of life under the Communists including work, food shortages, paranoia and spying on neighbors, socialist realism art and other propaganda. Toward the end of the museum there is a small room where a video loop runs, explaining the situations and protests that led up to the Velvet Revolution, when the unpopular Russians left the country without a shot being fired. Find out more about the Museum of Communism in Prague. A bright light in the eyes, a fabricated dossier of crimes, unwarranted suspicions created an Interrogation Room atmosphere that made Kafkaesque paranoia real. The most chilling section of the Museum of Communism is the interrogation room, where citizens accused of real and bogus crimes were questioned and sentenced without trial or mercy. The Dancing House building, designed by Frank Gehry and opened in 1996, is the newest landmark in ten centuries of Prague architecture. Dubbed the "Fred and Ginger" building, the structure pays homage to the swank and graceful dance team of Fred Astaire and Ginger Rogers, who appeared in many Hollywood films of the 1930s. As the sun sets behind Prague Castle, the city lights up at night, turning into a place of romance and beauty.